At Alley, we frequently design sites that require any given component to appear in a variety of contexts. A visual style guide allows us to view the site not as a series of pages, but grouping of reusable components. Ultimately, this simplifies and standardizes the way our designs communicate. In addition, it jumpstarts future components and ensures that every aspect of that design will be legible and recognizable to the user. The complexities of modern web apps mean that designers and developers need to take the style guide one step further. A “living” style guide effectively shortens the distance between the style guide and a functional web site or app by bringing static design components into the browser and creating reusable, testable, modular design building blocks. A living style guide aims to simplify branding and communication as well as DRYing out your code and giving developers a more focused context in which to work. We’ve been using living style guides at Alley for about six months and find it to be a huge help managing the design and build for the type of large-scale publications (or systems of publications) we work with. We’ve found that when working on a large build it’s vital to begin the process with a modular mindset. Pixel perfect, hi-fi layouts don’t factor into our process except as a tool for client buy-in; each page is a jigsaw of responsive, reusable, and (mostly) encapsulated components. 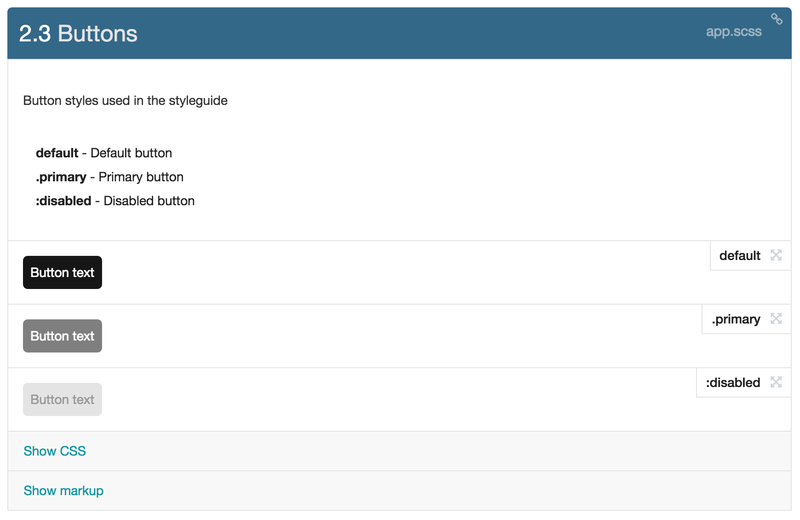 Our tool of choice for living style guides is one built by SC5 (here’s their live demo). The tool uses Angular and KSS to generate a style guide (or, as they call it, a “styleguide”) directly from your stylesheets. Alley has found the tool fits in quite nicely with our SASS workflow, though there are still some pain points. (We build custom websites and, ultimately, our style guide may require a more custom solution.) For now, the SC5 styleguide generator is a great jumping off point for anyone interested in using a living style guide for their work. The basic syntax of SC5 has ample documentation and at least one very thorough article by the style guide authors themselves. In overview, the tool generates your styleguide from specific commenting patterns in your SASS partials called KSS. The generator also has a few additions to KSS syntax that allow for more complex markup formulation. One of the most basic KSS functions is to create a section of the style guide. We recommend using a CSS preprocessor like SASS as an effective way to section your style guide (not to mention the variety of other great reasons for using a preprocessor). A preprocessor’s @import will allow you to separate your style guide into encapsulated sections and subsections more effectively. To that end, we recommend putting each of your sections in a separate partial and, if your build is large enough, each related set of partials in their own directory with an “importer” partial. Keeping the code in one place will make it easy to get an overview of the component, build new features and make changes. Only the code within the partial containing the section declaration will appear in the “Show CSS” section of the style guide front end. If you separate some code into a new, unsectioned partial, that code will not be displayed by the style guide. It enforces modular thinking instead of page-oriented thinking. The site you’re building is not a series of pages; it is an ecosystem of individual, reusable components, each with their own distinct purpose. One of the features available to us through KSS—and extended by SC5—is the ability to display various element states and variations thanks to the concept of modifiers. Using KSS syntax, we’re able to define a list of different views for the component and give them a description. Each item in the list will then be rendered by SC5 in its own separate container, as part of the component section. Because the styleguide’s KSS markup is rendered via shadow-DOM, CSS declarations for wrapper elements will not be inherited to components. This can make it difficult to set base font styles, for example. In order to send style declarations to the shadow-DOM wrapper, they can be added to a class (ex: .body) and included with the commonClass CLI option at runtime. To simplify your commonClass config string, inherited styles should be set up to cascade into a single class. Now .sg-common will include both html and body styles in the shadow-dom wrapper. To include the commonClass when styleguide is run, update your project’s package.json to include --common-class \”sg-common\” as part of the styleguide CLI script to apply the .sg-common class to the shadow-dom when you run the styleguide. In our example, we should the common class in the same document as the body and html classes. However, in reality you should aim to separate all your styleguide-specific code into a different stylesheet. For more info, see the styleguide docs: html and body styles. Component markup in the styleguide can be reused in subsequent component blocks using the sg-insert reference tag. This can be useful when modular layout items need to be nested inside of larger layout markup or displayed as a variation adjacent to any additional markup. For more info, see the styleguide docs: Inserted Markup. While writing KSS markup for components you may find that you need to simulate arbitrary layout or content elements that are outside of the scope of the component on which you’re working. This can be achieved with the sg-wrapper syntax in your KSS. For more info, see the styleguide docs: Wrapper Markup. For bigger or more complex component builds (for example fly-out menus or lists of posts) you may want to consider building an inserts-only file, comprised only of KSS blocks to be referenced via sg-insert tags in component files. This allows you to keep dummy content and other KSS overhead separate from SASS files needed by the theme to generate stylesheets. These article blocks can then be added, for example, to your styleguide component files for a list of blog posts, or a block of featured posts. Each individual component file would then apply its own styles to a reusable set of article markup. --extra-head \"<link rel='stylesheet' type='text/css' href='/styleguide-layout-styles.css'>\"
We’ve used this technique to add in some Alley branding to the styleguide for presentation purposes. If the blocks within the ignore comments are required for the component to be displayed properly, for example column widths, you may need to find a solution which allows you to use extends or placeholders which don’t require calculations. The SC5 Project is open source and available to view and contribute to on github. Since the project is relatively young, it’s not without issues. For example, while using SC5 on our first project, we uncovered a genuine bug while trying to use <sg-insert> within an sg-wrapper block, and noticed that the markup was not output. I submitted a bug report on GitHub, which was acknowledged within 24 hours. The issue was patched a few months later, and will be included in the next release. One of the many joys of working from home is avoiding rush hour headaches. But commutes to work have a purpose — they are cues that your work day is beginning or ending, and provide a clear separation between home and the office. How can you recreate this when working remotely? Since Alley’s founding in 2010, we have evolved into a fully distributed company with nearly 70 team members spread across the United States, Canada, and Brazil. While we’ve learned to mitigate the challenges of working remotely and pride ourselves on having a strong work culture, we feel it’s critical for everyone to have the opportunity to be in the same physical location and meet face to face. Ready to start planning your next project? Stay up to date with news, features, releases, and more.